The bustle of Casterbridge is part of the charm of Thomas Hardy’s work. He sums up a little market town with the most perfect attention to detail: we first see it from a bird’s eye view and come closer, and closer, until we are gazing at paraphernalia in the shop windows. In Casterbridge High Street, Hardy says, there were “timber houses with overhanging stories, whose small-paned lattices were screened by dimity curtains on a drawing string, and under whose bargeboards old cobwebs waved in the breeze. Casterbridge is part of Hardy’s Wessex, a long way from the Berkshire countryside. Yet somehow, one market town in Berkshire has managed to save many of its buildings. And in doing so it has retained a Casterbridge-like charm. Don’t get me wrong. It has multi storey car parks and chain stores, and modern life flows through it as life always has. It has long been a prosperous place. But somehow, where others have razed their history to the ground, Newbury, in Berkshire, has kept its old buildings standing. So park in the multi storey, and file out through the brand new shopping centre towards the High Street and you will come face to face with the profile of a building which has been there for almost 500 years. It is the gable end of a house. It was clearly a very old house, and mediaeval. It adjoins Marks and Spencer’s: and it bears an inscription. This is a town which remembers its heroes. 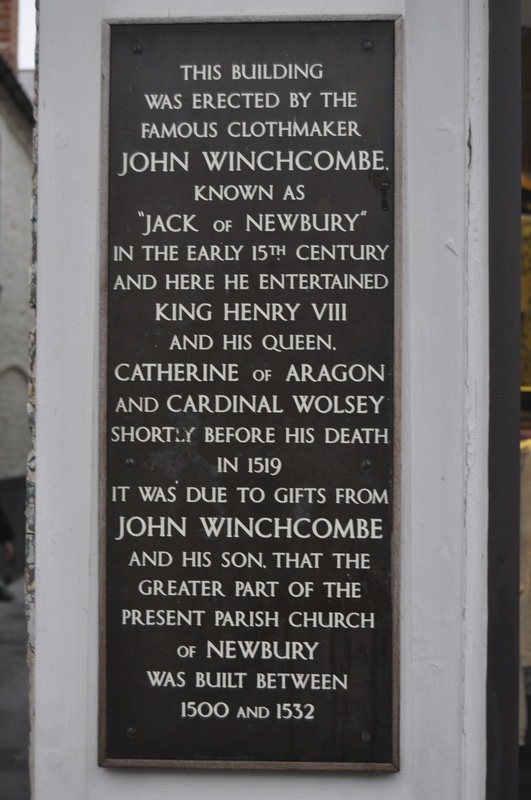 Jack O’ Newbury – John Winchcombe – started off as a monk-novice far away in Gloucestershire but it did not suit him, the story goes. He joined a band of players which came to Newbury Market, and soon made himself useful in the cloth trade, the principle trade in the town. Apprenticed to a worthy cloth merchant, when the businessman died, Jack married the merchant’s now wealthy widow. A pamphleteer got hold of Jack’s story and turned the whole thing into an earthy romance, highlighting the fiery relationship of the pair. Indeed, we can still see the window through which an irate Jack is said to have admonished his wife in the early hours of the morning, when she returned after a day out with her girlfriends. The townspeople have held fast to their clothmaking heritage, and painstakingly catalogued their lore. They relished the day mill owner John Coxeter made a daring bet: that, with the aid of the new cloth-making machinery available in the brave new era of 1811, he could shear the wool from the back of a sheep and have it made into a coat in just 24 hours. Two sheep arrived at nearby Greenham Mill, at 5am on June 25th, 1811. And that night, Coxeter sat down to dinner, having been applauded by a crowd of 5,000 locals, in a glorious blue coat which is now a treasured possession of the town’s museum. The buildings are breathtaking, just standing there because they always have: an Old Cloth Hall dating from 1627; and the granary, built to store grain at the time of Charles II with an incredible overhanging timber balcony; the coaching inns which retain the space for stagecoaches, though only their ghosts frequent Newbury theses days. Once Newbury was on two of the most significant coaching routes in the country, relegated to the status of backwater by the Great Western Railway. The town has the self-effacing pragmatism of a farmer. Yet here is the spirit of Casterbridge, many years on, preserved if you will but slip off the M4 to explore. Posted in Places to visitTagged Britain, cloth trade, england, history, Jack O' Newbury, NewburyBookmark the permalink. I really like the picture of the bridge. It reminds me of a trip that I made to Cambridge years ago. It’s a classic little bridge, Steven. I know Newbury quite well, or thought that I did until today. It’s sad that the English did not adopt the French ideal of putting all the horrid shops and buildings on the outskirts, whilst retaining the ancient character of the buildings in the heart of the town. . It is sad. For us English progress so often has to mean a complete start from scratch. I mourn everything we have lost because of that. I love old stone bridges and this one seems really cool. Standng on it is a treat, Jas! I’m sure the mansion servants are very happy about the “traction” rule – LOL! I bet they are. Renders the air a little clearer and the sound a little quieter, BB…. Loved this Kate.The buildings seem so lovingly preserved! Isn’t Newbury supposed to be the location of the Kennetbridge fair from ‘Jude the Obscure’? It is, is it not, Nancy? Mind you, Coxeter had an entire industry at his fingertips. What a showman, eh? Interesting comparison, Kate. My mother in law was from Dorset, she will be turning in her grave 😉 Have you been to Weyhill? That’s where they had the Fair about which he writes. I haven’t. I did a tour of Hardy country a very long time ago, organised by The Marist as it happens; but it is time I went again and retraced my steps. I’m not for Hardy’s fatalistic writing but the way he captures place is unparalleled. I agree, and the thought of what went on at Weyhill……. John Coxeter gives new meaning to pret au porter (ready to wear). Impressive. It is. A piece of blustering showmanship which has been remembered ever since, Judy. Fabulous pictures! Thank you for taking me here, Kate. What a fine story. It is possible to make wool, colour it, weave it and sew a coat. I learned to do this, “just in case,” but it took longer than a day. Have you noticed to what extent Hardy’s characters walk? Excellent post. Thanks, Micheline: I had not. His stories are so often centred on a limited grographical area which permits it, I suppose; I must re-read more of his books. I enjoy Hardy. He is a great author. In fact, England has had many great authors. I think I noticed that his characters walked a great deal because here, in Canada, walking is not really possible. When David (my husband) and I lived in Normandy, we walked so much. Everyday. Thank you Kate. I always enjoy your posts and the lovely pictures. Karen, I am late in answering you: but what splendid research, as usual. I love the Corn Palace. What a show-stopper: very Brighton Pavillion. 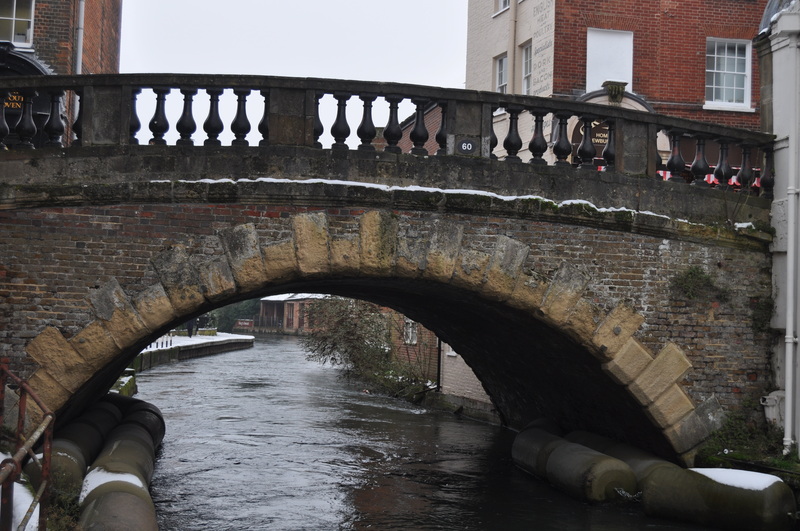 AS for buildings slipping into the canal, that is another blog-post’s worth: some of these places settled there centuries ago, and they’re not going anywhere now 🙂 Must do a little more research around that! Last one there’s a rotten egg, Andra: I have designs on it myself. Something canal-side, I think…. Gosh, the corbel is lovely. Will send you some photos of the ones at my home sometime! Ooooh, now I’m very curious indeed, Tammy. There’s not many can boast their own corbel. Wonderful post full loaded with interesting history. I enjoyd every photo, although my favorite is the first one. Thank you Matti! The bridge does seem to be drawing people. It has little bridge-houses on its four corners which led to vaulted store rooms within the structure of the bridge itself. It’s a lovely town, Tandy! I love the “traction rule.” The bridge itself is quite lovely. The history is always compelling and I enjoy the opportunity of accompanying you on your jaunts! You find such interesting little places in addition to the grandeur of castles! ‘Did’ the Hardy novel for O-level eons ago but, along with ‘The Trumpet Major’ it made little impression on me other than to put me off Hardy. Your Casterbridge musings have almost persuaded me to give them another go. Almost. It is hard to wade through the maudlin stuff to get to these wonderful descriptions of place, Chris, don’t you find? Hardy was such a fatalist. Indeed! And fatalism can be fatally depressing. Still, legions of Hardy fans can’t be wrong, and I am so often wrong that when my current to-be-read pile shrinks a little, or even a lottle, I will give at least one of those titles another chance to win me over.